Investigations of dewatering plumes to inform deep-sea mining operations. The remotely operated underwater vehicle (ROV) SIO Trident and associated equipment sits on the back deck of the R/V Sally Ride, ready for PLUMEX-related operations. One of the pressing environmental questions facing the ocean is the potential impact of the proliferation of deep-sea mining activities. There is some emerging concern that the physical oceanographic and flow transport modeling performed to date is insufficient to rigorously assess the impacts of mining projects scheduled to start in 2017. Of particular concern is whether upwelling and currents could carry pollutants up out of the deep sea, or from spills and leakages into marine food chains where they may poison marine species and threaten human health and food security. All of these impacts need to be further quantified and studied. PLUMEX has recently begun with the first field study to obtain in-situ data to investigate the dynamics of turbulent, negatively buoyant plumes, characteristic of a dewatering plume created by surface processing for deep-sea mining operations. The R/V Sally Ride is our operating vessel for generating a turbulent plume of dense seawater and is mounted with a phased-array Doppler Sonar (PADS) for making cross sectional velocity profiles of the plume. Also we will operate the SIO Trident ROV equipped with a CTD and fluorometer to monitor other major characteristics of the plumes (e.g. maximum depth, density) as a function of input parameters such as the release depth and release buoyancy. Complementing the fixed-depth images obtained by the PADS, the ROV surveys will give additional information on characteristics such as the final depth reached by the plume, estimates of entrainment at the plume edges, density within the plume, and how the plume spreads along the equilibration isopycnal. Schematic of the experiment. Water drawn from the ocean is mixed with hyper-saline (or sediment-laden) water prepared on board the vessel, and the mixture is pumped back into the ocean as a plume at depths in the range 25-100m. The evolution and steady-state nature of the plume is monitored using PADs acoustic technology mounted on the fore of the vessel and ROV technology. 24 tons of salt need to be stored on the vessel, and there will be two ~20m3 storage containers as reservoirs for hyper- saline water. 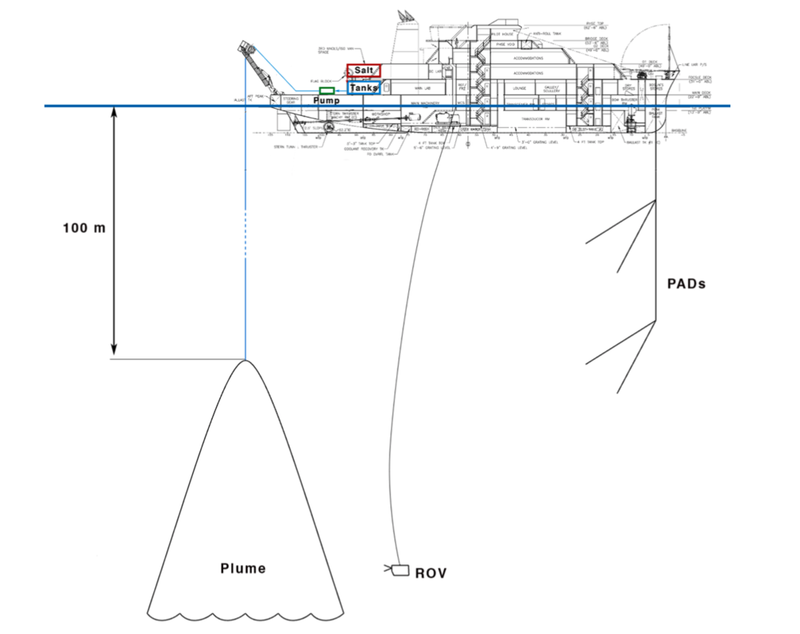 The plume hose, ROV umbilical, and PADS will all be in the water between 25-125 m depth at the same time; careful coordination and ship handling will be required. These experiments will provide field validation for rigorous analytical and numerical models which will ultimately help set international legislation for deep-sea mining and provide a foundation on which to design associated Marine Protected Areas.